What’s that in the sky? Is it a bird? No! It’s your very own WWII style Foam Airplane Glider! Remember, way back when you were a child, hoping that mom and dad would let you pick up just one small toy from the store? This was the one you always picked! Foam gliders have proven to be an all time, hall of fame level toy! 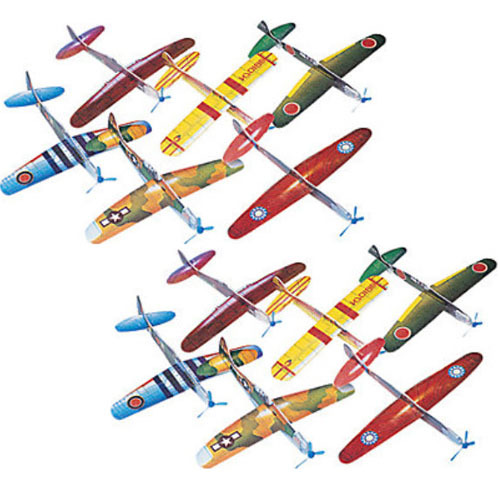 Relive your childhood with one of our Foam Airplane Gliders. Lightly toss them into the air and watch them soar! The light weight design allows them to be flown almost anywhere. Take them to the park, in the front or back yard, or any open area! These are also great as party gifts. Place them in a party gift bag, or hand them out at the door. Everyone will have a great time tossing their very own WWII Foam Airplane Gilder! This ad is for twelve (12) WWII Airplane Foam Gliders. Style is random. Foam WWII Airplane Gliders Qty 1 Foam Glider Description What’s that in the sky? Is it a bird? No! It’s your very own WWII style Foam Airplane Glider! Remember, way back when you were a child, hoping that mom and dad would let you pick up just one small toy from the store? This was the one you always picked! Foam gliders have proven to be an all time, hall of fame level toy! Relive your childhood with one of our Foam Airplane Gliders. Lightly toss them into the air and watch them soar! The light weight design allows them to be flown almost anywhere. Take them to the park, in the front or back yard, or any open area! These are also great as party gifts. Place them in a party gift bag, or hand them out at the door. Everyone will have a great time tossing their very own WWII Foam Airplane Gilder! (This ad is for one (1) WWII Airplane Foam Glider. Style is random) Quantity: 1 WWII Airplane Glider STYLE OF PLANE IS RANDOM. PACKAGING DOES NOT ALLOW FOR PREVIEW OF STYLE.